During our design sprints, everyone sketches. It's a fast way to iterate on ideas, a fast way to make ideas more concrete and a fast way to communicate those ideas. We specifically use Sharpies during our design sprints so that ideas and sketches need to be at a high level. We’re not trying to get all of the details on the page. We're only looking to head in the right direction. The Sharpies also help level the playing field of drawing skill. These sketches shouldn't look like works of art; we're not looking for people to be the next Monet or Picasso. They just need to convey a solution to a problem. Sketching serves as a way to get all ideas, including bad ideas, out of each person's mind and shared tangibly with the group. By getting ideas on paper it allows your mind to move on from it. Those bad ideas might serve to spark a great idea that is a solution that works really well for the problem we're designing for. Sketches are not just a tool for ideating but also be used as a tool for prototyping. Paper prototyping and prototyping apps, such as Marvel and Invision, enable really quick ideas to be prototyped and tested with people that have the problem. All of our interfaces start as sketches before designers mock them out and implementing them. 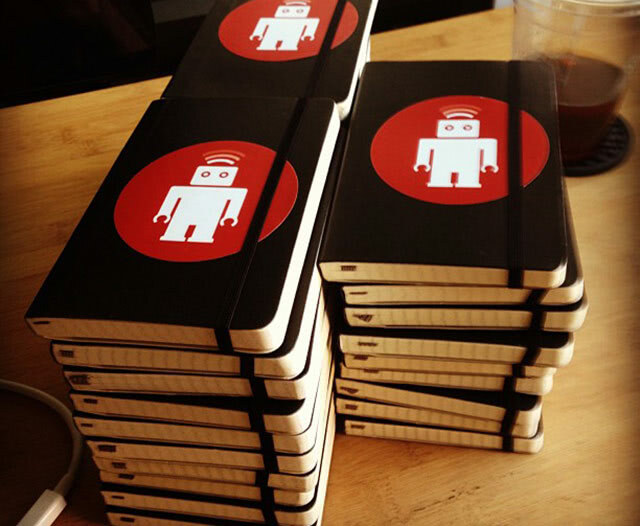 We typically have many Moleskine squared, soft, pocket-sized notebooks around the offices. Take one. The pocket size encourages the habit of getting ideas onto paper whenever and wherever they hit us. The pocket size also forces design constraints and mobile-first thinking.